Be the first to share your favorite memory, photo or story of Caroline. This memorial page is dedicated for family, friends and future generations to celebrate the life of their loved one. 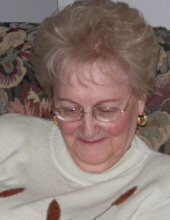 Caroline L. Marakovitz, a longtime resident of Canton, died peacefully on January 13, 2019 at St. Mary’s Hospital in Livonia after a long struggle with dementia. She was preceded in death by her husband, William J. Marakovitz in 1992, as well as two sisters and one brother. She is survived by her sons, Cary (Janis) and Terry; granddaughter, Kristianne (Nicholas) Tomasak; great-grandchildren, Braeden and Addisen as well as nieces, nephews and extended family members. A Memorial Mass will be held at St. Mary Our Lady of the Snows, 1955 E. Commerce St., Milford on Friday, January 18, 2019 at 11 AM, with visitation beginning at 10:30 AM. Msgr. John Budde to officiate. For further information, phone Lynch & Sons, Milford at 248-684-6645. "Email Address" would like to share the life celebration of Caroline L. Marakovitz. Click on the "link" to go to share a favorite memory or leave a condolence message for the family.